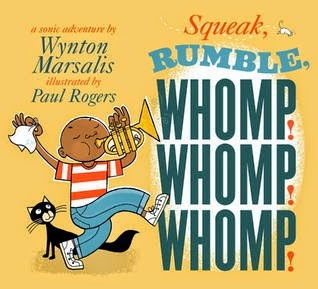 Book: Squeak, Rumble, Whomp! Whomp! Whomp! : A Sonic Adventure by Wynton Marsalis, illustrated by Paul Rogers. This book is filled to the brim with fun sounds. I found the kids repeating them or saying them along with me. It's a great introduction to many of the sounds kids hear every day as well as some of the sounds you can hear in music, particularly jazz music. This is a fun one to read aloud, but make sure you practice first; some of the sound combinations can be a little tricky to sight-read. There are tons of books that feature different kinds of sounds. I chose this one because I like the breadth of different sounds it includes. Then we repeated the rhyme, using Quiet and Loud to reinforce one of our sound concepts. Two little blackbirds, sitting on a cloud. [whisper] One named Quiet, [loudly] and one named Loud! 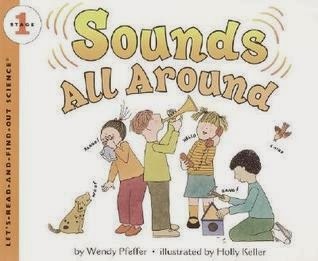 Book: Sounds All Around by Wendy Pfeffer, illustrated by Holly Keller. I did NOT read this entire book! I shared two spreads that talk about how sounds are made from vibrations and the sound waves travel through the air and vibrate the small bones in our ears. I asked the kids to put their fingers on their throats and hum to feel the vibrations. Then they put their fingers on their throats while they stayed quiet and then I asked them to hum again so they could feel the difference. I also demonstrated the vibrations with a drum. I put some dry beans on one of our tambourines and hit it with a drum stick. The kids could hear the sound, but they could also see the beans jumping all over the place due to the vibrations! Song with bells: I passed out the bells and we rang them high, low, in the middle. I asked them to ring them FAST and commented on how loud a sound we made. Then I asked them to ring them slow and commented on how that sound was much quieter. We repeated this and then I put on some music and asked the kids to ring their bells to the beat. Instruments: Once I collected the bells, I demonstrated some of the other instruments I had collected. We had a triangle, sandpaper blocks, a tone block, and a rain stick. Each object made different sounds and I demonstrated some of the sounds they could make. Before we had free time to explore stations, I briefly explained the activities at each of them and I let parents know that since we were exploring sound it might get loud in the room. I know some kids are sensitive to noise and I understood if kids needed to take a break from our noisy room. Instruments: I put out the instruments that I had demonstrated (along with tambourine) and allowed the kids to try them out. The triangle was particularly interesting because the kids could feel the vibrations through the string when they hit the instrument. Sound Hangers: You can see one of our sound hangers in the photo with the instruments. I found this activity at Buggy and Buddy via Pinterest. I demonstrated how to hold the strings and cup your hands over your ears and let the hanger bang gently against the table. The sound travels up through the string and is amplified by your cupped hands. Since I knew it would probably get pretty loud in the room, I encouraged folks to take it just outside our room if it was too loud to hear. Can Do! Science Kit. We purchased several of these science kits from Lakeshore Learning and this one has lots of fun activities for exploring sound. The small cardboard disks show different activities for the kids to do. Container Sounds. This was by far our most popular activity and (bonus!) it was the cheapest and the easiest to put together. I found the idea on The Pleasantest Thing via Pinterest. I purchased a bag of dry black beans and put out all kinds of different containers for kids to pour them into. What different sounds do the beans make as you pour them into different containers? I tried to find containers made from different materials - plastic cups, an aluminum bowl, a styrofoam egg carton, a ceramic mug - and different shapes - a plastic champagne flute, a plastic bowl, a plastic bag, etc. As usual, I let families explore the stations at their own pace while I circled and engaged kids in conversations about the activities they were doing. I had a book display and take-home papers with book lists and additional activities to do at home. It WAS very noisy, but it was also a lot of fun and learning. I had a bunch of older siblings at this session and they were engaged with the activities, too. Exploring sounds is lots of fun!